I can't think of a better way to end this momentous night/morning of boxing than on that tweet from American promoter Lou DiBella. What a time for Great Britain. If you missed it, Tyson Fury is a world heavyweight champion after a remarkable night in Dusseldorf and some 3,500 miles away, James DeGale took care of business. It has been something of a special few hours. Take a look at the BBC Sport boxing index to see all of the reaction and follow-on stories. Thanks for being with us, farewell. Well, in an eventful night, well-known promoter Lou Di Bella, who also featured in the last Rocky film, toasts a new golden era for British boxing. Tempting Carl Froch out of retirement? Lucian Bute - though game throughout - will now find himself on the long road to boxing recovery if he decides to fight on. Just a few defeats in this sport can lave one in limbo. In contrast, James DeGale, who has battled injury in recent years before claiming his title, will continue to see his options expand. Big arenas, big-fight cities, big-name opponents. Oh yes, it's good to be 'Chunky'. Asked if WBC title holder Badou Jack is his next focus DeGale replies: "Vegas. April next year let's do it, let's unify titles. WBC and IBF world titles." James DeGale reacts to his first defence of the IBF title: "I said Lucian Bute is a world class fighter. I'm young, fresh and peaking now but all credit to him. Hes a champion and believe me he will be back. "I think my defence was alright, I still have to work on things. The next three or four years, that's when I'll be at my best." Wow, the finish by Lucian Bute certainly prompted a worry but DeGale wins by street on the judges' cards. He was slick in there, of that there is no doubt, but he arguably brought problems to his own door by easing off in parts and allowing his opponent to constantly take the centre of the ring. Job done though, who is next in line? The boos ring out. James DeGale will care little, he takes a unanimous decision and it's by some margin. It's 116-112, 117-111 and 117-111. It's a performance which may draw some questions of James DeGale. He started well but couldn't put the hammer down and get his man out of there. Interestingly, neither fighter really celebrated. They know this is close. James DeGale poked his tongue out but that was as colourful as it got. Eddie Hearn, DeGale's promoter, stands hands on his waist and wears a concerned look. Surely Lucian Bute needs a knockout? He gets through with a left hand, it's a clean shot. James DeGale has to run away briefly. We have two minutes to go... they lock horns, close together, both try an uppercut which yields little. One minute... DeGale tries a right hand which misses, then right-left-right, all miss. These are tired shots now and Bute lands, DeGale felt it, then a jab hits his jaw. The judges will be needed and that was a strong finish from Lucian Bute. James DeGale runs from his corner and swings a wild right hand. If that's what this final round will deliver us then strap yourselves in. A brief pause with a couple of minutes of the round remaining as James DeGale loses his gum shield. Just 70 seconds of the three minutes remain, the pair are close, they could kiss one another but instead it's a right hook by DeGale which is deflected away by a glove. More chanting for Lucian Bute but a beautiful right gets through his guard. Again though when a fighter in this contest is under pressure they react angrily and admirably. A good end to the round by Bute but that one will not be one on his scorecard. There is still energy aplenty on show here. This is not like the energy-sapped ending we saw to Klitschko-Fury earlier. Lucian Bute tries a big ranging left but it's slipped. Credit to James DeGale, his footwork and weaving is admirable defence. "That's why your'e a world champion, that was world class." Lots of groans from Lucian Bute as he throws five quick shots to head and body, all get taken with some comfort by DeGale though. That flurry and its lack of damage may hurt Bute's confidence. There can be nothing worse than seeing your opponent just smile back at you. DeGale goes on the attack with a combination of his own, fast, fast stuff. He ducks into a left hand though and as the ding, ding, ding arrives, DeGale's tongue is again out to mock Bute. So how many of you have stayed up to watch this barnstormer of a fight? We enter the championship rounds. These are the ones that matter. Again, the round starts with James DeGale circling the ring, allowing Lucian Bute the centre. James DeGale has some very nice footwork to show off. Forward, backwards, sideways, he is comfortable in any corner of the ring. He is a Strictly Come Dancing contender in the making. Work to do yet though as when briefly cornered, these home fans get excited. It's all getting absorbed though by DeGale who tried to go over the top of his rival's guard and another straight right is followed by a left hook to end the round nicely. Just 12 minutes to go in this one - James DeGale's first world title defence, remember. He's winning on our card. "Start digging deep now and putting it together." A four-shot combination from James DeGale, they are all a little slappy but still show work ethic. You get the feeling this is on if he steps it up a little and these last four or five rounds are the time. He backtracks and stops in his tracks to spring forward with a right. Good, organised boxing from DeGale. He screams that he is in control. Lucian Bute's back has barely touched the ropes, he is the man taking the centre of the ring a lot but James DeGale is happy for it to happen. He seems to want tempt his man on and then unload, back, a big left hits Bute flush in the face. The right uppercut is a key shot for James DeGale. When he is in close it's on time after time and with 90 seconds of the seventh left, he lands it. Boom. A show of anger from Lucian Bute as he pushes his man back to the ropes but he cannot build on it and two right hands in combination get DeGale out of trouble, his power blasted through his opponent there. How concerned will James DeGale be about that cut? It must be on his mind. He's on the back foot a little which is risky when you're fighting away from home. Forward comes Lucian Bute, his confidence has grown and grown. A cracking left hook from James DeGale. Wow, that hit like a hammer. Just as Lucian Bute committed to a right hand he left and opening and wallop, it was taken up by DeGale. Much better. He gets into the pocket, nice and close, uppercut, uppercut, two of them were rapid an had a heap of power behind them. Some showmanship at the end of the round. That one is DeGale's, no question. No more damage to the cut either, a good three minutes. "This guy is running away." We have a change in momentum suddenly. 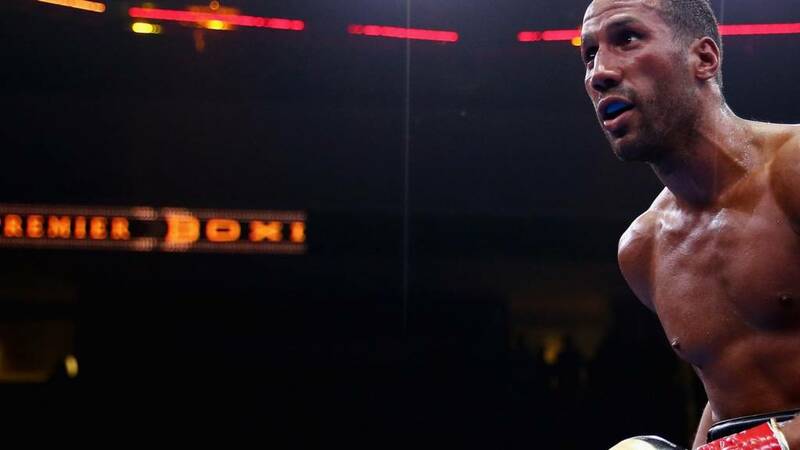 James DeGale finds himself on the ropes and some quickfire combinations from Lucian Bute will sap the champion a little. "BUTE, BUTE, BUTE," we hear the crowd chant. Left, right, left, all onto the guard of DeGale. The confidence is growing for Bute and even having his head jerked back by a straight right doesn't thwart him, he finishes the closing seconds by backing DeGale up again. So we'd probably say three one in the scoring to James DeGale. Aright hand jab slaps the guard of Lucian Bute early in the fifth. Lots of instruction coming from the Lucian Bute corner. James DeGale shows his energy though, dancing around his man and offloading with little impact. Again Bute basically asks if Chunky has any more and suddenly he has his man a little worried, backing him to the ropes and landing shots which draw a roar from the crowd. That will prickle the judges' interest and this is a clear round for the challenger. As the bell rings DeGale pokes his tongue out cheekily. That's a show of defiance, he lost that round clearly. Scotland's former world champion Alex Arthur has a fancy for James DeGale but a specific warning... the body punch. James DeGale against the ropes, his guard comes up like a a brick wall and there's no joy to be had for the challenger. Lucian Bute's hands remain high as the pair jostle for position while DeGale is not scared to drop his leading hand as he looks for an opening. This is heading towards a knockout you would think as both men are throwing, it's more destruction derby than chess match. Left uppercut, right hook from DeGale late on but he gets tagged with a hook and a straight shot seconds later. A close round. Straight right, hook right from James DeGale to start the third. Lucian Bute, all 35 years of him, is game though and soaks it up like a sponge. This contest throws up a rare event in that both men use a southpaw stance. What does that mean? They will lead with their right hand, with the left hand ready in the background with the power shot. DeGale beat Andre Dirrell in May - another southpaw - so he knows his way around the style for sure. There is an energy about James DeGale, his footwork is neat and tidy, his hands explosive and aggressive. He's looking busy when the chance to throw a shot arrives as three or four blows land in the blink of an eye. Lucian Bute goes low to the body as the bell rings but it looks to me like a second round for DeGale. The fighters are in close again early in round two and James DeGale's hand speed when he's that close to his opponent looks very, very dangerous. He swings a right around the guard of Lucian Bute. DeGale is not averse to switching from his southpaw stance to orthodox. Lucian Bute maintains a fairly high guard, his red gloves offer little target. James DeGale gets in close and lets a body shot go. Bute is game, he takes it and comes back for more, backing the Englishman up to the ropes. Bob and weave from Bute and the pair are in close again, a rock solid left hand from DeGale. These two are having a right ding dong early on and long right hand pierces the Bute guard, a great straight shot from Chunky. I'd say he takes the opener. Forward they both come, centre of the ring, left hook from DeGale, left jab, looping right, all catch the guard, it's zippy work. Rapid hands in the opening minute. So here we go then, 12 rounds where on paper at least, James DeGale's position as IBF world champion will be tested. "Live from Quebec City... Ittt's shooowtimmme," says Jimmy Lennon Jnr. Lucian Bute ducks and weaves in his corner. He slams his gloves together. A lean, ripped look to him despite some serious weight gain from weigh in to fight night. DeGale looks smooth, black trunks with gold trim, a sip of water as his name is read, there's a tonne of swagger on show here as he raises his right hand. And now the champion "JAMES 'CHUNKY' DEGALE", yells Jimmy lennon Jnr. What's the music of choice? A tune called 'Right Above It', by Lil' Wayne. "Now tell me how you love it"You know you at the top when only heaven's right above it..."
The Smith brothers, Paul and Stephen, who are half of the famous Liverpool boxing family that all claimed British titles in recent years, have sent their best wishes to James DeGale. Paul lost his British title to DeGale in 2010 when the Olympic gold medallist stopped him in the ninth round. Will DeGale face another Smith brother when the youngest sibling Callum finds himself in a number one contender spot? And, with esteemed ring announcer Michael Buffer in Dusseldorf, it's over to Jimmy Lennon Jnr to introduce these two scrappers. Lucian Bute is first out - to the U2 track 'Where the Streets Have no Name'. "That hold me inside ..."
A rapid three-shot combo from James DeGale in his warm-up, he's looking sharp to say the least. The fighters are keeping us waiting. These nerve-filled moments before the walk to the ring are key, stay loose, ready the mind, don't let an ounce of fear enter the psyche. Are you going to be showing your support through the night? Tweet us using #bbcboxing. How do you view Lucian Bute's record? Do you see the man who entered his 2012 contest with Carl Froch with 30 wins from 30? Or do you see a man with two losses in four fights and going downhill fast? The ring is clear, the strobe lights race around the Videotron Arena where around 15,000 are expected to watch this super-middleweight contest. If it's half as dramatic as Kiltschko-Fury earlier, it'll be worth staying up for... or getting up for. Carl Froch stopped Lucian Bute in the fifth round in 2012, can DeGale do better? That would at least provoke some debate. Hayden Shipman on Facebook: "Just because Froch destroyed Bute doesn't mean you can write him off for this fight." Lucian Bute uses the ring alias - Le Tombeur. By our reckoning that translates to 'The heartthrob'. Anyway, dodgy names aside, he is some fighter and defended the IBF super-middleweight title nine times between 2008 and 2012. A record of 32 wins - 25 by stoppage - from 34 fights ain't half bad either and he's feeling confident ahead of meeting DeGale. "It's a great opportunity to fight for my old belt in front of my hometown fans. I think they'll push me toward the victory," he said. "I think he's the best super middleweight in the world right now, but I'm very confident in myself. I'm healthy, I feel great physically." Do you have the fight to stay up? We are closing in on fight time ladies and gents as the final fight on the undercard enters round 12. Surely that means James DeGale and Lucian Bute will be in this ring in around 20 minutes time? Lucian Bute is a well known sporting celebrity back in his native Romania. Originally born in Galati before moving to Quebec as he embarked on a professional career in 2007, Bute has received many honours from Romanian President Traian Basescu. He joins the likes of footballer Gheorghe Hagi, gymnast Nadia Comaneci and Ilie Nastase of the tennis world, who have been rewarded for their services by their homeland. Bute was also named Romania's athlete of the year for four consecutive years from 2008 to 2011. Mark Hemmings on Facebook: "I hope this fight isn't forgotten by the tyson hype. It should be a better fight anyway." James DeGale's trainer Jim McDonell: "Confidence comes from your preparation and James' has been absolutely fantastic. James has trained like a challenger. "Bute is a smart fighter, a southpaw so James has to do what he is good at and dissect his weaknesses. Once his concentration is good, he's the best fighter at this weight in the world." So Klitschko wants a rematch but still, we can hype up and question Tyson Fury's future right? He of course now owns the WBO, IBF and WBA titles, so what about a unification contest against WBC champion Deontay Wilder? The American has already tweeted to warn Fury he is coming for him and this tweet followed. Wladimir Klitschko has already told the media he intends on taking up a rematch option with the new IBF, WBA and WBO world heavyweight champion Tyson Fury. But the last Briton to hold all four titles in the division - Lennox Lewis - thinks the Ukrainian missed the late Emmanuel Steward - who died in 2012 - in his corner. Former world heavyweight champion George Foreman adds: "Didn't see Klitschko losing, I can see a rematch. I'm excited about Fury though. Wilder v Fury." If you've been on a big night out or locked away in a dark room, you may have missed Tyson Fury making history earlier as he claimed three world heavyweight titles by beating Wladimir Klitschko - who is now sporting a shiner below his left eye (pictured). It is Sunday after all, so Fury has given his first tweet since the fight a religious theme. To look back on the momentous match, click here. Getting the hands wrapped is almost a spiritual process for a boxer. A moment of quiet, some time to think as the wraps go round and round the knuckles. James DeGale looked focused as he watched on under the glare of the cameras. "Bute's good - but I'm the best 168lb'er and I'll prove it tonight," he tells reporters. The Cobra was just too good that night - inflicting the first of Bute's two career defeats and taking the same IBF title on the line tonight away from the Romanian-born Canadian. Such is the rampant speed of the roll out of social media gizmos, James DeGale has just uploaded a live Periscope. In it we see him warming up from the dressing room with promoter Eddie Hearn watching on. Loosening exercises, shadow boxing and sips of water are all on show. Business time. "They think it's going to be a boxing match, but it will be a destruction," said James DeGale, 29, ahead of his first world title defence. "I feel like a beast. I'm going to start fast and throw loads of punches. Once he feels my power that will be it. Place your bets, trust me." But DeGale is 189 days without a fight - that's the longest he's gone without a contest in his career. You're a lucky guy Gaz. You may have time for dessert. My guess is around 5am UK time give or take 15 minutes. The final fight on the undercard to this one is underway, to we are probably 45 minutes - less if this contest ends in a knockout - before DeGale gets in the ring. Plenty of time for a coffee, maybe even a bacon sandwich. James DeGale weighed in at 167.4 lbs, fractionally heavier than Lucian Bute at 167.2. Interestingly, both men weighed over 177 lbs 24 hours later - showing you can indeed put 10 lbs on in a day if you try hard enough. Keep that in mind on Christmas Day folks. So former world champion Barry McGuigan thinks a DeGale stoppage is on the cards. But what do you think? Let us know on #bbcboxing. Anyway, you loyal bunch, thanks for being with us at this crazy hour. If you're just in from a night out, make sure you eat something to soak up your sins. If you've rolled out of bed, get a warm drink. Well done on getting up - that's proper commitment. For those of you wondering why boxing is taking place at such a time, blame geography and time zones. Quebec City - close to the Canada-America border - is our focus and they are some five hours behind us. Anyway, time won't stop us from bringing you the best stats, tweets and every blow - get in touch with us on #bbcboxing. So how do you follow the historic way Saturday ended? It's fair to say James DeGale will have to produce some serious magic if he is to take any of the limelight from Tyson Fury's sensational points win over Wladimir Klitschko. One can only try. And facing a man with just two defeats to his name in 12 years, DeGale will have to go some to not only win but to cause a tremor across the world of boxing this morning.